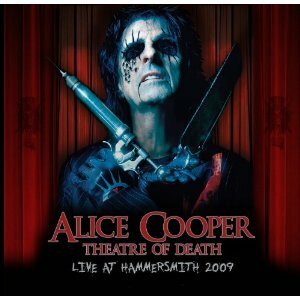 ALICE COOPER - THEATRE OF DEATH - LIVE AT HAMMERSMITH 2009 (CD+DVD SET) | Online Shop | Wizard LTD. Album: "THEATRE OF DEATH - LIVE AT HAMMERSMITH 2009 (CD+DVD SET)"
This release captures a 2009 Alice Cooper concert in front of an enthusiastic crowd in Hammersmith. The setlist includes classics like "Schools Out," "I'm Eighteen," "Welcome to My Nightmare," and "No More Mr. Nice Guy."